I haven’t made anything too exciting for Kate’s lunches recently, so I knew it was time to try a new recipe! I checked out my friend Susan’s blog (Our Family Eats) and came across her super simple and mouth-watering buffalo chicken taco recipe. I decided to make buffalo chicken quesadillas instead of tacos to put my own little spin on it and make it less messy for Kate to eat. I cooked up the buffalo chicken in my crock pot, shredded it up and sandwiched it (along with bleu cheese crumbles and shredded cheddar cheese) in between two whole wheat tortilla shells that I then pan-seared on the stove to make a yummy melted quesadilla. These were so delicious that G and I were gobbling them up as well! Want to see what’s on my plate? Like All Things G&D on Facebook to find out! I’ll be featuring another one of my favorite work week lunches tomorrow! 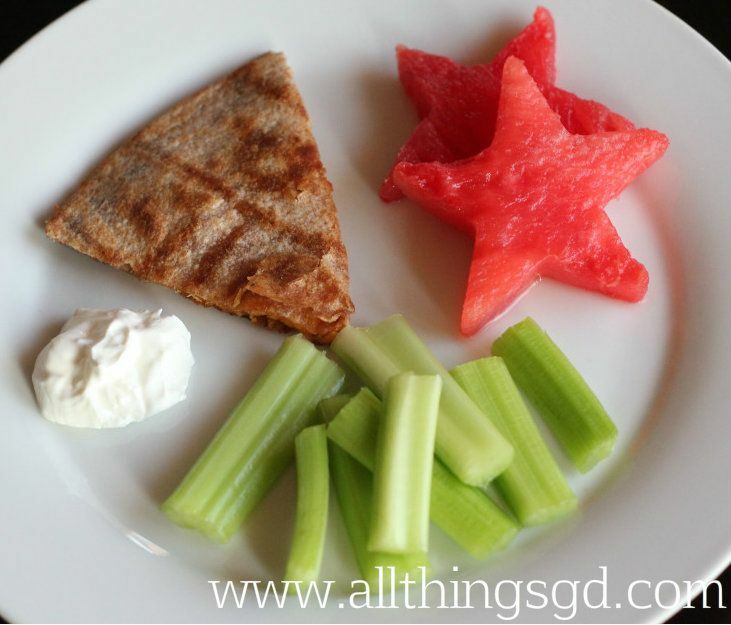 I LOVE the star shaped watermelon! So cute! Wonderful. I need to bust out the cookie cutters more often….such a cute reminder here. And I am definitely going to try the buffalo chicken. Thanks, D! Thanks for posting the lunch ideas! Question…what kind of things do you typically give Kate for breakfast? My daughter is not really picky but she rarely eats anything except fruit and eggs for breakfast. I would love to try some other stuff to see if she would eat it. The buffalo chicken quesadilla sounds delish! Might have to work that into our weekly menu next time! Thanks (as always!) for sharing!